You know you are experiencing yo-yo dieting, but do not know how to stop it! It is time to get your balance back. The following easy weight loss tips will help you lose weight in a healthy way. For instance, you weigh 140 lb and you perform 20 mins of moderate activity every day. BMR of this example = (140 x 15) + (20 x 3.5) = 2100 + 70 = 2170 kcal. BMR minus 500kcal; it would be 2170 – 500 = 1670 kcal. Therefore 1670 kcal is the target in this example to losing 1 lb per week. Tool: Use our online Calories Calculator to calculate how many calories you need every day. Fruits and vegetables are packed with beneficial fibers, vitamins and antioxidants. They fill up your stomach fast so you feel full earlier. They are also low in calories and helps to keep your calorie count low. Eating small frequent meals help to balance your calorie intake throughout the day and also keeps your blood sugar level balanced. Instead of eating 3 big meals, try to eat 5 – 6 smaller meals throughout the day. Purchase fresh foods and avoid highly processed foods. In my book Go UnDiet, I called out highly processed foods (I call them HPFs in short) as the real culprit of obesity, not meat or carb. HPFs and fast foods are often higher in sodium and fat content. Many people we spoke to are amazed that they can easily lose weight by packing a home-cooked lunch to work instead of eating out. Everyone has his or her favorite treats. Simply allow yourself a little indulgence, but watch out for the frequency and the quantity. Having a small treat once in a while can be rewarding to your weight loss experience. Cutting too much of your favorite treats usually lead to an early relapse. A product labeled with a fat-free claim does not mean that it is low in calories. Similarly a product labelled as low-sugar or low-carb does not mean it is low in fat or calories. Always read the nutrition label on the packaging. Juices, soda, cream & sugar in your coffee or tea all add up. Opt for drinking mostly water in a day. In addition to providing hydration to your body, it will also help you feel full. 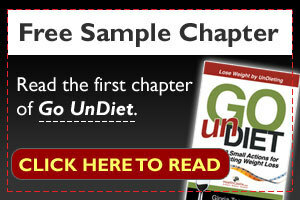 In my book, Go UnDiet, I reviewed various drinks sold widely commercially. I found that some drinks, like milkshakes, are calorie-bombs with over 1000 calories! Keeping a food journal helps you pin point your eating pattern and will enable you to easily modify it. If possible, have your Registered Dietitian review your journal. Most authorities recommend 30 – 60 minutes of physical activity a day to stay healthy. Also try adding weight-bearing exercises at least 2 times a week. This will help burn some of the unwanted calories.